This mod is intended to fully replace the original "AnimaWheelLink" that sits in the bottom right hand corner of the screen. Buttons have a rollover state for when your mouse is over them. The constant glow of 'PAY ATTENTION TO ME' has been removed. An option to show text to the left of the button. 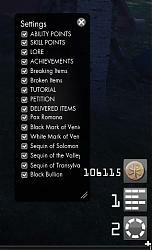 Used icons from the main menu / token window to indicate what each notification is. Notifications can be dismissed with right click. Clicking on a notification has a slight audio feedback. Tokens (Cash, Solomon Island, etc) can also be tracked. Finally a settings window to toggle what shows up. 1.1.1 - notification values will now update as values are spent if not dismissed, removed static SP cap. Is there any way to get just the "Hide SP notification" functionality without anything else? I don't want all the other stuff in this mod. So I was trying to find options for it's appearance. Is there a way to leave the notification appearances alone and just have the options to turn on and off specific notifications? I like having my AP and SP there in the corner so I can keep track of when I actually have enough to spend and like the original appearance (huge monitor, the tiny space they take up is miniscule for me ^^). Just want to be able to turn off some notifications and SP when I have the skills maxed. Been waiting too long to rid of AP/SP updates. Add a Minimum value to show the icon. Is there the ability to move this whole thing from the right corner and maybe flip it horizontal, so I can put it across the top, right under the black strip while having it fill out from left to right? Can you please make the settings window sizeable in width for other languages? Last edited by Percles : 08-04-2012 at 01:14 PM. When i try to get some settings off they reset each time i take quest (after the cutscene) or change zone. This is a great idea. Nice job on the artwork, very professional and intuitive. Would it be possible to have an option to show the numeric values more like the default UI - in a box on the lower right of the icon? This would save some screen real estate in that area, where I put my target info and damage meter. Totally doable, I'll get to it when I get home. 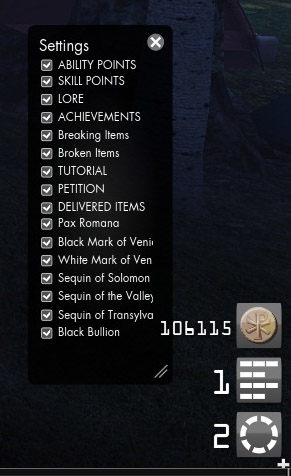 Icons look very nice. Shall give it a try.